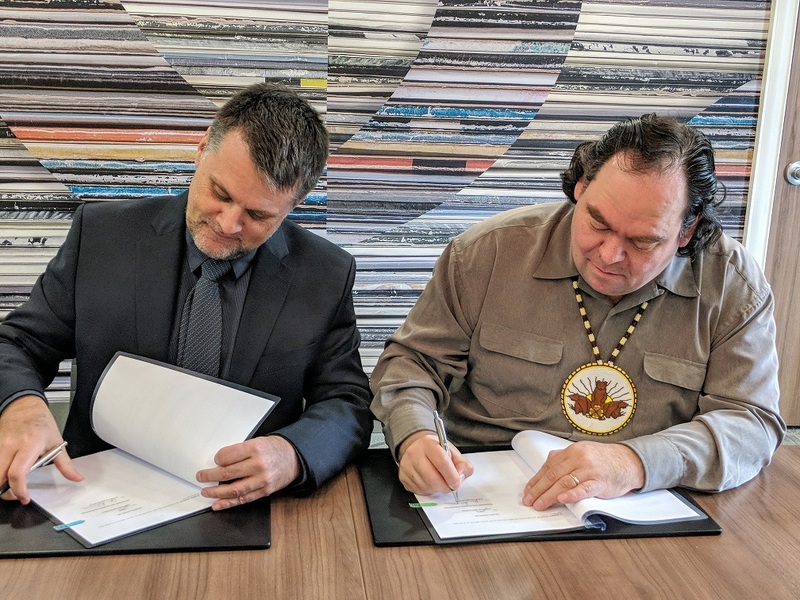 Joint venture agreements with high-profile service providers to the mining industry have been signed and partnerships are formed within First Nations and the mining community. The Canadian Mining Expo in Timmins will for the first time feature a First Nations Partnership Pavilion under the BIG TENT on June 5th & 6th, 2019. The groups will showcase their respective businesses, but also demonstrate the competitive advantages and economic benefits of developing relationships that include shared values and respect for cultural diversity. These partnerships have quickly become recognized as a mutually benefiting agreement among First Nation groups and non First Nation companies. 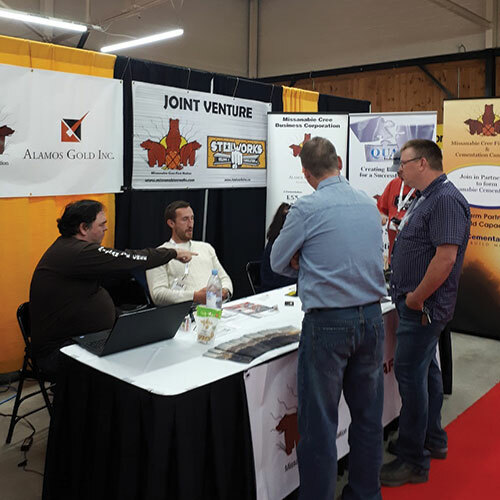 Joint venture agreements and plans to unveil corresponding projects at the Canadian Mining Expo will be well marketed and well publicized through the organizers, First Nations, partners and the City of Timmins. All are welcome to attend the inaugural event. The Missanabie Cree First Nation negotiated land agreement with Canada that provides them with reserve status on over 3,900 hectares of their ancestral lands and includes entitlement to mining and mineral rights that will provide greater economic opportunities for the community. The lands are in the Dog Lake area, east of Wawa and west of Chapleau, an area that has become a focus of gold exploration activities. 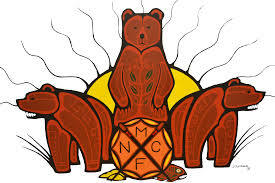 Missanabie Cree Business Corporation (MCBC) was created in 2014. Over 30 joint venture agreements have been signed with high-profile service providers to the mining and forestry sectors.The Missanabie Cree First Nation signed a partnership agreement with Cementation on June 7, 2018 at the Canadian Mining Expo in Timmins. They have quickly become a progressive leader among first nations groups in signing 30 joint venture agreements and plans to unveil the corresponding projects in 2019 at the Canadian Mining Expo. Chief Jason Gauthier, Missanabie Cree First Nation says “We are excited about our latest partnership with Cementation and combined we feel the groups can bring value to future mining projects here in northern Ontario throughout the traditional territory of the Missanabie Cree First Nation." Missanabie Cementation Inc. is a majority First Nations owned partnership focused on underground mine development opportunities in northern Ontario. 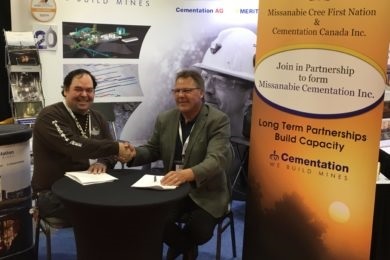 “We feel this partnership between Cementation and the Missanabie Cree First Nation will be a strong first step towards capacity building including training and employment opportunities for the citizens of the Missanabie Cree First Nation resulting from the local mining resource industry. We anticipate future mine development in the area and the business opportunities this can bring to the partnership.” says Eric Kohtakangas, Executive Vice President, Cementation Canada. The First Nation Partnership Pavilion 2019 will highlight many of the partnership agreements recently created with the Missanabie Cree Business Corporation (MCBC). Representatives from industry and the Missanabie Cree First Nation will be on hand to discuss the proceedures and benefits of their partnership agreements. This is a unique opportunity to get both sides of the story and learn about the results. This is your chance to talk to other companies that have already set up successul, mutually benificial First Nations partnerships and learn how they did it. It is also an opportunity to connect with other First Nations groups who are open to partnership agreements.